RNIB Collection Acc No: Mus/1. The Hammond 2 braille typewriter was an adaptation of James B. Hammond’s 1881 typewriter with a Braille attachment over the carriage, and modified keys that could be located by touch. 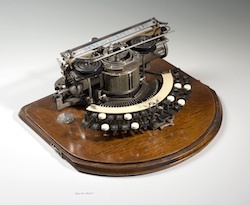 This typewriter was owned and used by George W. Bartingale (1899-1971), a keen natural history enthusiast. One of the most famous early typewriter users was the philosopher Friedrich Nietzsche, who acquired a Malling-Hansen Writing ball in the 1880s as his sight failed (he abandoned it soon after). This typewriter is set on a mahogany wood base, which is curved at the front. The letter keys are positioned in two curved lines, the second line raised above the first which is at the front. Most of the black square keys are inscribed with Roman alphabet letters and numbers. On the lower line and raised lines are four ivory round keys: on the lower the third and sixth from left and right respectively and on the raised line the second and fifth from the left and the fourth and seventh from the right. A curved ivory panel is set alongside the top of the keys in the raised line: it is inscribed ‘MADE IN USA. Hammond’. Behind this is a wheel made of vertical metal springs, and behind that a cylinder made of metal meshing. On the left hand side of the cylinder is a metal lever, on the right hand side a grooved turning wheel. Raised above the mesh cylinder and at the highest point of the typewriter is a metal strip containing the Braille alphabet, fixed by screws.